“A classic thriller as two youngsters race from crooks, kidnappers and the police … in search of their long-lost father. 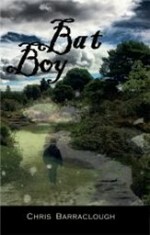 A wonderful, gripping story, from the first words to the last.” Chris Barraclough, the author of BAT BOY, keeps his readers spellbound – not just by the frantic, hilarious and wildly suspenseful plot, but by the perfectly realised character of Joel, the narrator, who is 12 years old and has been blind since birth. Chris Barraclough is an award-winning author and journalist, based in London. BAT BOY, his first full-length novel, won the 2010 International UKAuthors Opening Pages Competition Award, and has garnered garnered high praise for its wildly humorous and suspenseful story – one that never lets up, carrying Joel and his brother on a desperate journey, twisting and turning through the seedy backstreets of London and finally out to sea, for a superbly dramatic climax.